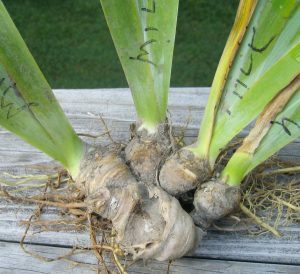 If your bearded irises have been in the same spot for over four years, or the plants don’t bloom as they did once, it’s time to dig, divide, and replant. July is the best time to do this task and your iris plants will thank you with more blooms next year. Here’s what you need: a digging fork, a sharp knife, a pair of scissors or garden shears, a permanent marking pen, a bucket for clippings, and a pair of garden gloves. Iris Clump - "mother" with "children"
Start at one side of the iris clump, carefully digging the plant mass out of the ground. You’ll notice that some of the rhizomes have no leaves growing out of them; these are the ‘mother’ rhizomes that bloomed in prior years. Along the sides of these ‘mothers’ are the ‘children’, who are ready to grow and bloom on their own. 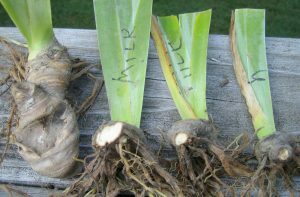 Shake off any soil that clings to the roots, and use your knife to separate the smaller rhizomes from the old ‘mothers’. Trim the leaves in an inverted V shape to account for the loss of roots, to shed water, and for replanting. Write the name of the iris cultivar on the leaves of each plant (or the color of bloom if you don’t know the cultivar\). Now you have three rhizomes. The fourth one can be discarded. Clean the soil from each plant and set out in the shade to dry. Here’s the most important step in the replanting process – renewing of the garden soil. Bearded irises grow best in a neutral pH or slightly acid soil. If you have clay soil and lovely pine trees and azaleas, your soil is probably quite acidic and you’ll need to add lime to the garden bed. Be sure the bed gets at least a half a day of sun and is free of roots from nearby plants. When you’re ready to replant, place the rhizomes with the toes pointed towards each other in a triangle. Spread the roots out and downward in the soil. Don’t cover the top of the rhizome; it needs to be exposed to the sun. Water to help settle the soil. If there isn’t adequate rain for the next few weeks be sure to water until the new iris planting is established. Wait until fall to remove any dead iris leaves and your iris blooms will be the stars of your spring garden next year.